Following the successful launch earlier this year of the View Legal Directors Duties, Estate Planning, business succession and binding death benefit nomination apps, we have now developed and launched a further Apple and Android app. SMSFs can provide a range of benefits and opportunities not available via any other retirement savings approach. SMSFs are however heavily regulated and it is vital that fund members have a deep understanding across all relevant areas. 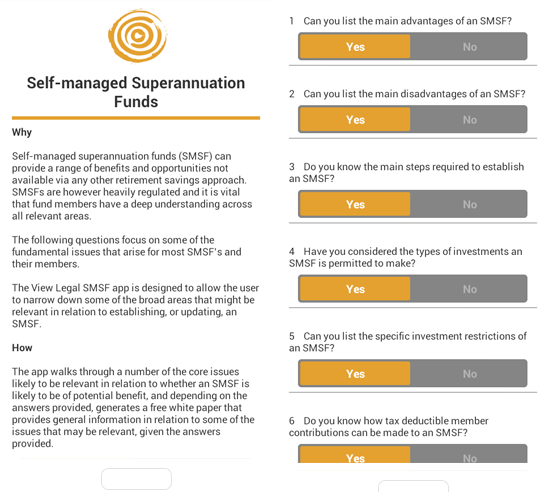 The SMSF app is designed to allow the user to narrow down some of the broad areas that might be relevant in relation to establishing, or updating, an SMSF. Depending on the answers provided, the app generates a free white paper containing general information in relation to some of the issues that are often relevant. View Legal is a specialist law firm, focusing on tax, structuring, asset protection, business succession and estate planning. The founders of View Legal are committed to building a law firm that our friends would choose. View Legal is results focused and passionate about delivering solutions in a way that aligns with our 'SPS' - service and price satisfaction - guarantee. 1. The information on this blogspot is of a general nature, not intended to be specific professional advice. Please seek the opinion of a professional to advise you for your situation. 2. The author’s opinions are his own and do not represent the view of any other person, firm or entity. 3. The author is not responsible for the accuracy or appropriateness of third-party comments or articles, including those of guest authors and editorial contributions. 4. Any comments, letters, and other submissions are moderated and may be edited or withheld at the sole discretion of the author.